The tagline "A Community Bound By Books" gets to the heart of what BookPeople advocates and, in many ways, makes possible. For more than 40 years this downtown Austin bookstore has brought locals and visitors together over the love of reading. Some of the most important authors of the last four decades have stopped by the bookstore (the largest in the state of Texas), to share their stories. In addition to a slew of monthly author events and book clubs, the store hosts summer literary camps that bring books to life for children. And they help put on the annual Texas Teen Book Festival, which celebrates the teen reading experience by letting attendees visit with the most popular young adult authors in the country. 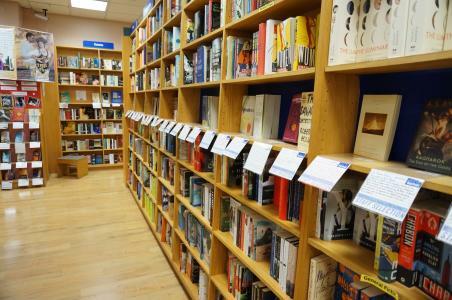 What makes BookPeople a must-visit for a first timer in Austin? We&apos;ve evolved from a small, niche bookstore to become the largest independent bookstore in all of Texas. We work to maintain Austin&apos;s creative, welcoming, free-thinking spirit by encouraging our staff to personalize their book recommendations and by stocking books on every subject imaginable. We also offer a diverse author events program, welcoming a wide variety of writers to our podium year-round. What accounts for your success and longevity? All of our success is due to the support of our Austin community. Year after year, Austin&apos;s readers make a decision to shop their locally owned, independent bookstore. In turn, this means that we make every effort to ensure that we&apos;re evolving to meet customer needs and better serve the ever-growing city of Austin. We work closely with local school districts to bring dynamic author programming directly to our community&apos;s young readers and coordinate hundreds of free events each year that bring our neighbors, young and old, together to discuss books and the bigger ideas they contain. We are here for Austin; without the support of its readers, we wouldn&apos;t make it. What are your staff recommendations as far as must-reads this winter? Please share a few of your favorite children&apos;s books released in the past year. Please share some gift ideas for the hard-to-buy-for friend or family member. Socks, socks, socks. We sell tons, in all patterns and styles. You also can&apos;t go wrong with a BookPeople gift card, or with one of our book-a-month subscription services. Fore more information and details on upcoming events, visit bookpeople.com.